Conservation quality board, with a neutral or alkaline pH, is the preferred material for window mats and back mats. Items should be "hinged" to the back mat and not overall adhered or mounted to a board. Overexposure to light can cause structural damage to the paper support and can induce visual changes to the media such as fading of watercolor. The use of an ultraviolet filtering glazing material in the frame will lessen light exposure. Avoid storing items in basements with damp and dark conditions. Paper will buckle and distort in damp conditions and mold will grow, staining paper and media. 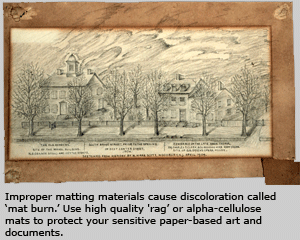 The hot and dry atmosphere in an attic can cause paper to contract and tears may form on the sheet. A room or a closet, in the interior of the home, can serve as a stable storage area. Discover other ways to frame, display, and protect your works of art on paper by contacting the paper conservators in the ART CONSERVATORS ALLIANCE. Don’t be fooled that UV-absorbing glass completely protects your framed textile; visible light must also be controlled. Since any amount of light is damaging to textiles, there must be a balance between enjoying them and protecting them. Try to keep your textiles out of direct sun and sunny rooms. It is a good idea to keep drapes closed and lights off in rooms that have textiles. If you are storing your textiles, try to keep them in a room that is lived in and avoid basements and attics. The general rule of thumb is: if you are comfortable, so are your historic textiles. Never use a cedar chest or any wooden or cardboard box to store a textile, even when the textile is wrapped in acid-free tissue. Any wood or cardboard will cause permanent staining. Wrap your textiles in a clean cotton sheet or pillowcase if you don’t have acid-free tissue paper available. Confused on how to care for your textiles? 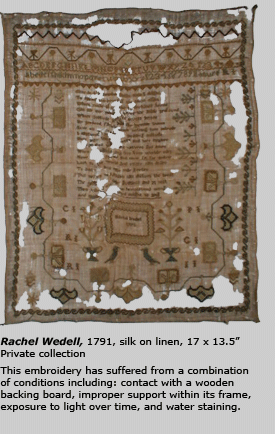 Contact the textile conservator in the ART CONSERVATORS ALLIANCE for guidelines on protecting and displaying your textiles. Original framing, especially when selected by the artist, should usually be kept. Paintings almost always look best in frames that the artist chose or designed. Keeping the original frame informs us how an artwork was presented when it was conceived. To prevent a painting from falling off the wall, always make sure that the picture wire is strong, D-rings are used to attach the wire to the frame, and one, or two large hanging hooks, are anchored securely to the wall where the painting is hung. 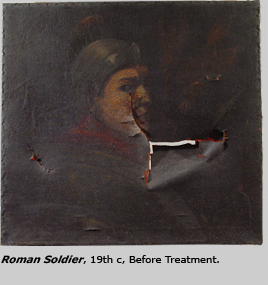 For additional guidance on the care of your paintings including proper framing and display methods, call or email the paintings conservator in the ART CONSERVATORS ALLIANCE. If you have a 20th Century plastic object that smells a little like vinegar, chances are good that it is made from cellulose acetate, and it is probably inherently unstable. In these cases, storing or displaying them in areas with good air circulation, where they will remain relatively cool, dry and out of bright light will prolong their life. 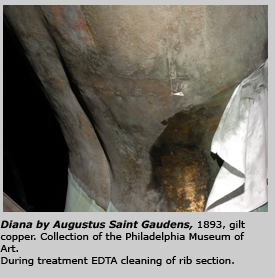 Sometimes the best solution for preserving an object is not to treat the object itself, but to provide a mount for internal or external structural support. Stainless steel isn't "stainless." Depending on which of the many alloys it is, the conditions of fabrication, the environment and the conditions of display, it can be more or less "corrosion resistant." For outdoor objects, paint should be considered a maintenance coating. Some will last for a few years. Some will last for decades. All paint fails outdoors. Confused on how to care for your objects? Contact the objects conservator in the ART CONSERVATORS ALLIANCE for guidelines on protecting and displaying your objects.